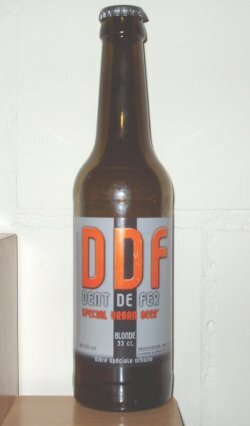 Brassée artisanalement à partir de pur malt et d’eau des Alpes, la Dent De Fer offre un reflet d’or, un goût discret de malt et de houblon sous une couronne de mousse fine et crémeuse. Bottle. Blond colour, hazy. No strong aroma, good flavour but not exceptional. A Mes rate: 33cl bottle at the Magic_dave6 shindig at Chris O’s. Tom and Pauline had eff peed off to bed at this point. They willl be gutted they missed this beauty. Clear golden brown with a big frothy head and lots of lace. Spice, hop and vomit. Sweet and undistinguished. Over carbed and all round pretty rum. Derp de der. Te teedeley toe! Bottle. Golden color with a white head. Sweet fruity but rather thin body. Fruity palate. Blond color. Very simple and common lager beer, very boring! <o>Bottled: Yellow coloured. Clear. Off white head. Fruity and light yeasty aroma. Flavour is citric, sweet and yeasty. Is quite grainy. Is light bodied and watery. Light hoppy nose, with some hay notes. Yellow colored body, small white head. Yeasty flavor, slight hoppyness. A yellow beer with a lazing white head. The aroma is sweet malty and slightly spicy, while the flavor is sweet malty with notes of honey, and a dry end. Thanks Alex (fiulijn) for this one.